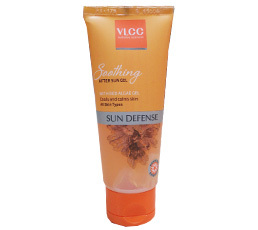 Buy VLCC Soothing After Sun Gel, with red algae gel. Cools skin, calms skin, Skin redness. Over exposure to harmful UVA and UVB rays of the sun is responsible for skin darkening and ageing. After a glorious day under the sun, VLCC Soothing After Sun Gel, Cools and calms skin, reduces redness and helps prevent peeling of the skin. A refreshing formulation, enriched with Red Algae Gel and Sebuckthorn Fruit Oil, it helps visibly reduce the after effects of sun exposure. It effectively hydrates dry, rough and chapped skin and helps combat against free radical damage. Apply an even layer on 'just exposed to the sun' skin for soothing and cooling relief. Reapply if desired. Red Algae Gel, Aloe Vera Extract, Olive Oil, Sandal Wood Extract, Seabuckthorn Fruit Oil, Witchhazel Extract, Chamomile Extract, Rose Water distillate.